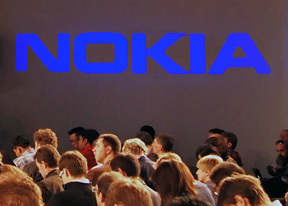 At the Mobile World Congress, Nokia announced the fourth addition to the Lumia family and it's the starter Lumia 610. Nokia have gone through great lengths to make the Lumia 610 as affordable as it could possibly be. Thanks to those efforts, the minimum system requirements for Windows Phone OS are now just 256MB of RAM on the Qualcomm 7x278 chipset. Said to retail for just 189€, it runs Windows Phone 7.5 Mango and is powered by a so 2010 800MHz single-core Snapdragon S1 processor and the said 256MB of RAM. In this quad-core-frenzied Mobile World Congress, a mere 1GHz single-core processor and the scant amount of RAM may make you yawn, but the Lumia 610 behaves quite well. We did notice some lag, but that probably has more to do with the pre-release status of the units at the Nokia booth than the chipset. The overall build of the Lumia 610 is quite solid as well. The device will come in white, cyan, magenta and black. As you see, we played with the white version of the phone and there's no getting away from its charm. It's built around a 3.7-inch TFT LCD display with a resolution of 800x480 pixels and, although it's a not ClearBlack AMOLED display, it gets the job done. We snapped several photos of the blue Lumia 610, too. We also managed to get our hands on a red Lumia 610. Enjoy! And here comes a brief video, demonstrating the Nokia Lumia 610 real-life performance. The Nokia Lumia 900 has been around for some time, but for AT&T. At the MWC stage Stephen Elop gladly announced that the flagship device will now start shipping globally in the Q2 of 2012. And in spite of LTE not being globally available, the Nokia Lumia 900 compensates by featuring DC-HSPA, which doubles the speeds of regular HSPA+. Otherwise, specs are pretty much the same as the AT&T version of the device. It features a 4.3-inch ClearBlack AMOLED display, a 1.4GHz processor, 512MB of RAM, 16GB of storage and an 8MP f2.2/28 Carl Zeiss camera with dual LED flash. Unlike it's American cousin, the global version of the Lumia 900 won't feature NFC. It will have Gorilla Glass to protect the screen though. The following video should give you an idea of the kind of performance you can expect from the Lumia 900.